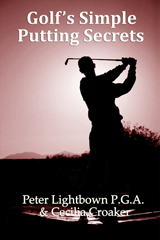 If you want to lower your handicap, enjoy your golf more and learn how to make an effortless swing you should read at least one of Peter Lightbown and Cecilia Croaker's books. Most of the books are available from leading ebook suppliers. Golf's Simple Secrets was our first book and what we thought would be our only book. When this book hit the IBook store it immediately became a best seller in Australia and performed well in other countries. An updated version of the first book with a couple of pictures. Buy one or the other and learn how to stop slicing, topping and shanking the ball. Third book in the series. You will learn how to pitch, do reliable bunker shots and the chip shot..
NEWS 6/2/13.. I am now taking bookings for golf lessons - please call me on 0415 740 511. We are going to print! Our print book will be available early next year. 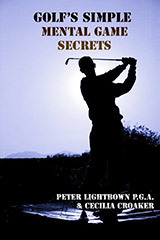 NEWS 10/11/2012..... We are thrilled that our new book "Golf's Simple Secrets - Increase Your Power" is finally finished and should be available in all the stores during the next couple of weeks. Find out the simple ways of developing an effective, natural putting stroke, free of anxiety and tension. We all know what it is like to hit a good shot followed by a terrible shot (or the post birdie syndrome) leaving us bewildered. Learn how to overcome this by practising at home and on the driving range. This is the book that you have been waiting for! 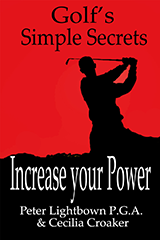 Learn in simple terms, a scientifically proven, effective way to increase your power and distance - not just for the driver but all you fairway metals, hybrids and irons too. "This book is truly helpful. Peter hits the nail on the head with his mental tips. A must have for every golfer!" For IPad or IPhone users withIBook App downloaded. Not all the books are available from Amazon at the moment. All our books are available from Barnes and Noble. All our books are available from Smashwords.